The bullet journal system uses symbols referred to as signifiers to give your entries additional content. 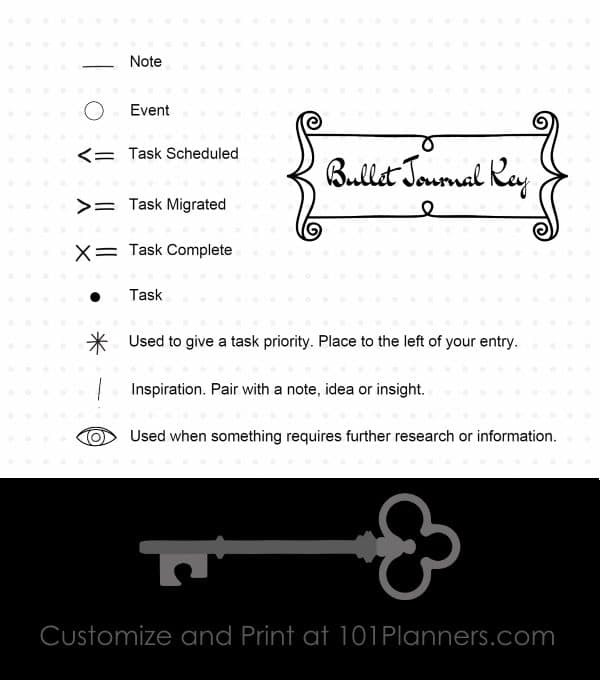 We have prepared a Bullet Journal cheat-sheet that contains a list of symbols below that you can use when you draw your journal or if you create it with our free bullet journal app. You can download the cheat sheet to reference when required. It can be downloaded as a PDF or an image (png). Please note that the key / cheat sheet can be personalized before you print it. You can edit the text, change the icons and add additional symbols and text. 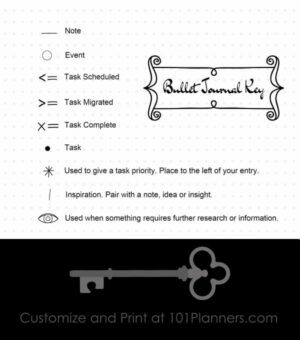 Ryder Carroll, who developed the Bullet Journal® (or BuJo® for short), only gives a few examples but encourages you to come up with your own symbols. These are the signifiers that he suggests we use. 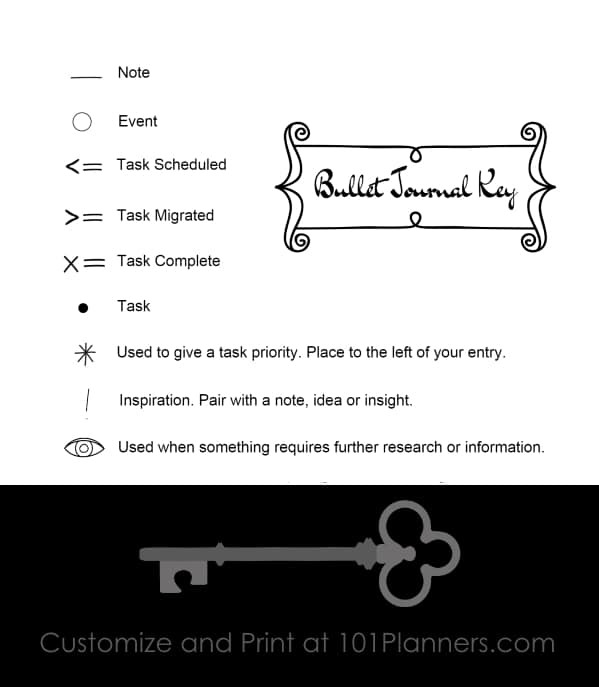 In addition to the above Bullet Journal symbols, you are encouraged to create your own key symbols. 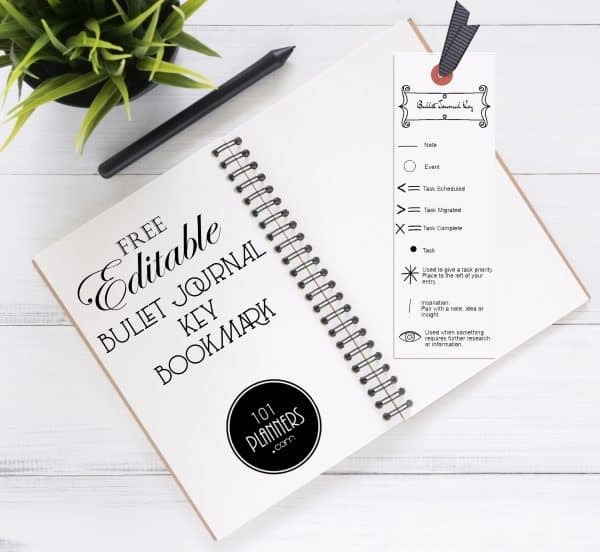 We have five different Bullet Journal key sheets for you to download. You can customize each sheet if you want to change the symbols, text or add your own. A list of the official symbols provided by Ryder Carrol on a bookmark. You can add additional symbols from our gallery. A list of the official symbols with some additional suggested symbols that can be edited. 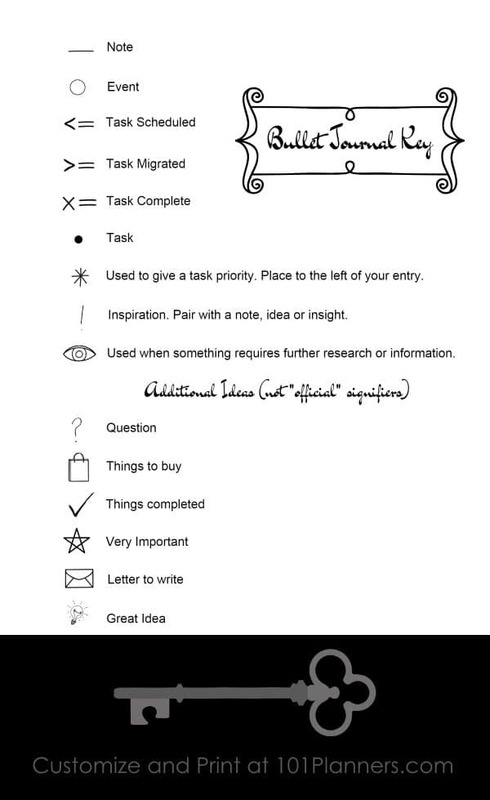 You can add, erase or change the symbols and/or explanations. A list of the official symbols with some additional suggested symbols that can be edited with a blank background. You can add, erase or change the symbols and/or explanations. How to edit the symbol explanation? Double click on the text that you want to edit and type the text that you want to appear instead. Select the image that you want to add. Drag it to wherever you want it to appear. Make it larger or smaller if necessary. Click on the text icon (A). Make it bigger or smaller so that it looks like the rest of the text. Click on “click here to select a design” (above the key). Select the relevant category (such as embellish title, arrow, border, etc). Click on the doodle that you want to add. Move it to the correct location and make it larger/smaller if necessary. Open the key and click on the page icon. The page will download as a PDF.